Fish and fishery products are becoming more increasingly important as primary sources of protein for many peoples in the world, most especially for those in the Southeast Asian region. Many Southeast Asian countries are among the highest producers of fish and fishery products in the world. This publication is therefore intended to provide readers with a glimpse of the contribution of Southeast Asia’s fishery and aquaculture production to the world’s food fish basket. Based on the data and statistics provided by the Southeast Asian countries, SEAFDEC compiled and analyzed the necessary information that went into this publication. 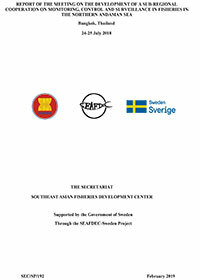 Of the 11 countries that comprise the Southeast Asian region, namely: Brunei Darussalam, Cambodia, Indonesia, Lao PDR, Malaysia, Myanmar, Philippines, Singapore, Timor-Leste, Thailand, and Viet Nam, only ten countries are covered in this publication in view of the unavailability of fishery statistics and information from Timor-Leste. From 2010 to 2014, the worldwide trend of fishery production from both capture fisheries and aquaculture (Table 1) had been steadily increasing at an average rate of 6.9 million MT per year or 3.9% annually. Countries from Asia are the major producers, contributing about 53.0% to the total fishery production throughout the past 5 years. Specifically, the contribution from the Southeast Asian region to the world’s total production was approximately 21.6%, which had been increasing from 16.7 million MT in 2010 to 42.2 million MT in 2014 at an average increase of 2.7 million MT per year or 7.8% annually. This feat has been achieved because of the intensified efforts of the governments of the Southeast Asian countries to promote responsible fishing practices and sustainable management of the fisheries sector, and the countries’ adherence to the new paradigm of change in fisheries management. During the period from 2010 to 2014, fishery production of Southeast Asia (Table 2) exhibited a continuously increasing trend not only in terms of volume but also in value. The annual average increase from 2010 to 2014 in volume was 7.8% and about 2.2% in terms of value. 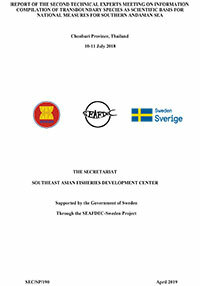 Although some countries were not able to provide the value of their respective fishery production in 2014, for example in the case of Viet Nam and Cambodia, the figures still imply that in addition to the increasing volume, most of the fishery commodities harvested in the region were of high value. By country, Indonesia reported the highest fishery production in 2014 in terms of volume accounting for about 48.8% of the total fishery production of Southeast Asia, followed by Viet Nam contributing about 15.0% and Myanmar at 11.9%. The Philippines ranked next accounting for 11.1%, Thailand at 6.3%, Malaysia at 4.7%, and Cambodia at 1.8%. Lao PDR, Singapore and Brunei Darussalam contributed the least volume to the fishery production of Southeast Asia in 2014. In terms of value, Indonesia led the Southeast Asian countries accounting for about 42.7% of the total value of the region’s fishery production with Myanmar emerging second contributing about 19.6%, and Malaysia came in third contributing about 14%. Meanwhile, the Philippines which came in fourth in terms of volume and value, contributed about 12.0%, and Thailand which ranked fifth in terms of production volume as well as value accounted for 10.5%. The trend of the fishery production of the Southeast Asian countries in 2010-2014 is shown in Fig. 1.a and 1.b. The drastic drop in the value of fishery production from Viet Nam does not necessarily mean very low or no value, as it only indicates the inability of the country to provide the necessary information on time. Fishery production of Southeast Asia comes from three sub-sectors, namely: marine capture fisheries, inland capture fisheries, and aquaculture. 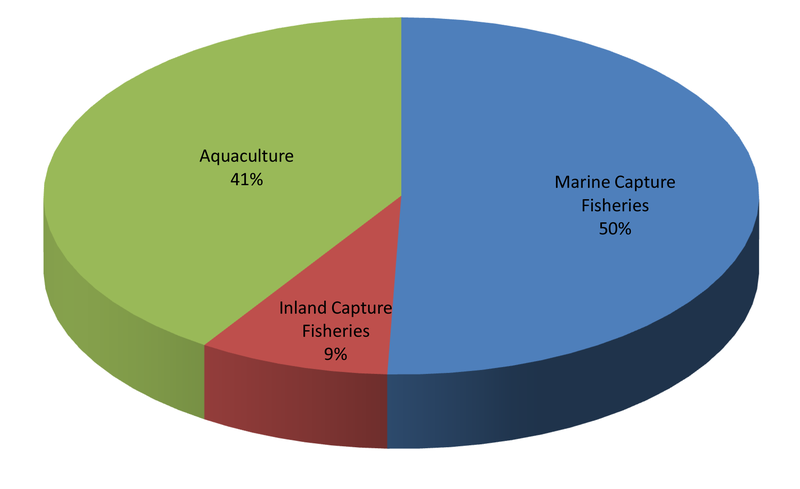 By sub-sector, the total fishery production of the region in 2014 as shown in Table 3, indicates that the largest portion of the production volume was derived from aquaculture accounting for approximately 53% followed by marine capture fisheries at about 40% and inland capture fisheries at 7%. 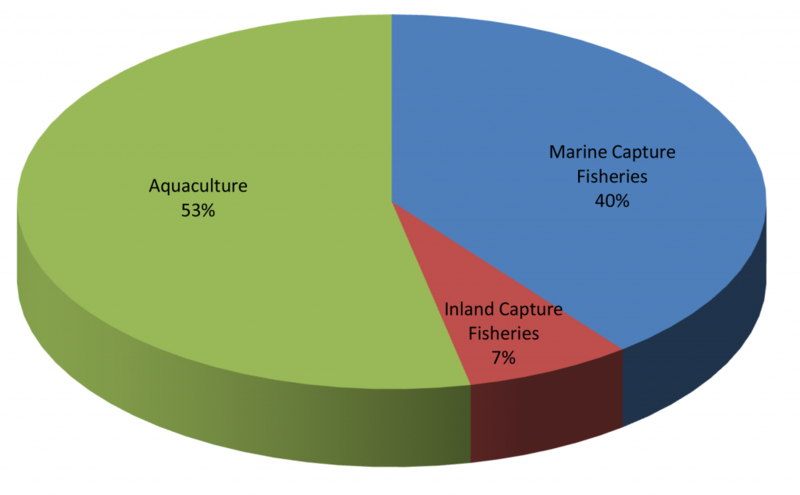 In terms of production value, the trend was quite different as marine capture fisheries accounted for 50%, aquaculture at 41%, and inland capture fisheries at 9% (Fig. 2.a and 2.b). While the value per metric ton of marine capture fishery products was about US$ 1,299/MT, those from inland capture fisheries and aquaculture were about US$ 1,220/MT and US$773/MT, respectively. This implies that the global market had started to recognize the value of aquatic products harvested through inland capture fisheries, and had been patronizing such products. 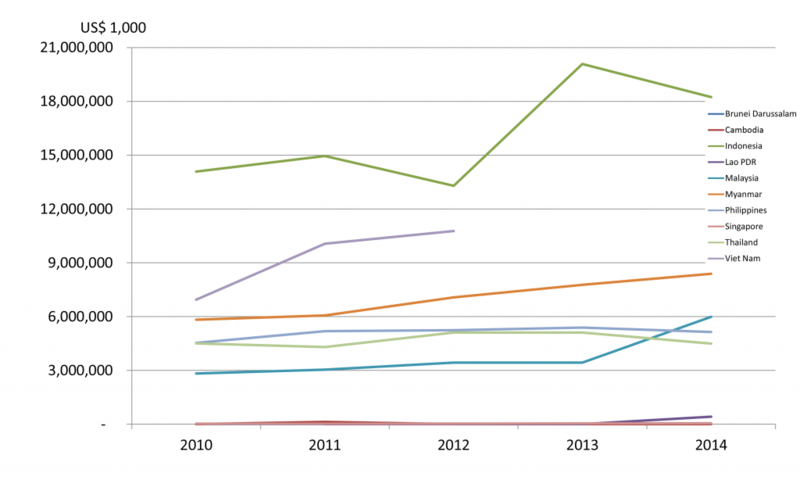 The region’s production from marine capture fisheries in 2010-2014 had been generally increasing as shown in Table 4. However, in terms of volume, the annual average increase was only minimal at about 3.0%. Meanwhile, the production value in 2014 had increased slightly by 6.3% compared with that of 2013 after a drop in value from 2011 to 2012. Such trend might have been affected by the severe drop in the total production value in 2012 influenced by the steep dive of the production value of Indonesia. Moreover, increases in the total production value from 2012 to 2013 had been very minimal, largely because of the unavailability of data from Viet Nam and Cambodia. In terms of quantity, the total production from marine capture fisheries of the Southeast Asian countries during 2010-2014 indicated that Indonesia contributed the highest production to the region’s total. Specifically in 2014, Indonesia’s production was 5.97 million MT accounting for approximately 35.8% of the region’s total, followed by Viet Nam, Myanmar, and Philippines at 2.71 million MT (16.3%), 2.70 million MT (16.2%), and 2.13 million MT (12.8%), respectively. Thailand and Malaysia had also produced considerable amount from marine capture fisheries at 1.56 million MT (9.4%) and 1.46 million MT (8.8%), respectively. 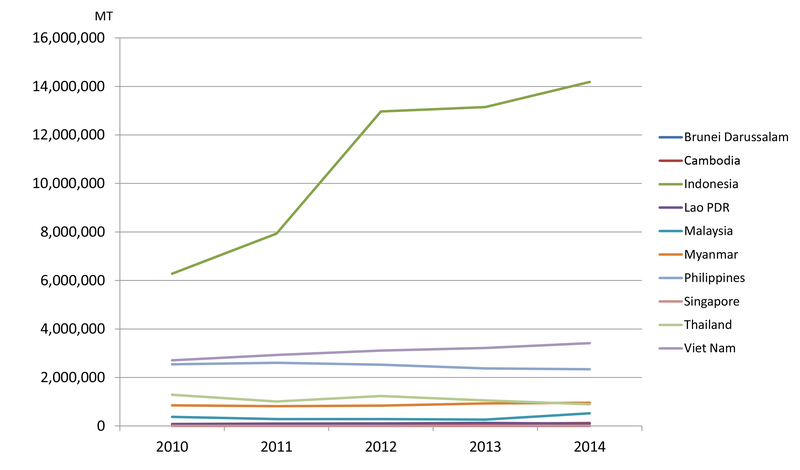 A picture of the region’s production volume from marine capture fisheries in 2014 could be gleaned from Fig. 3. Although some Southeast Asian countries were not able to provide the value of their production from marine capture fisheries, the total value of the region’s marine capture fishery production from 2010 to 2014 seemed to have increased corresponding to the increasing trend of the region’s production volume. 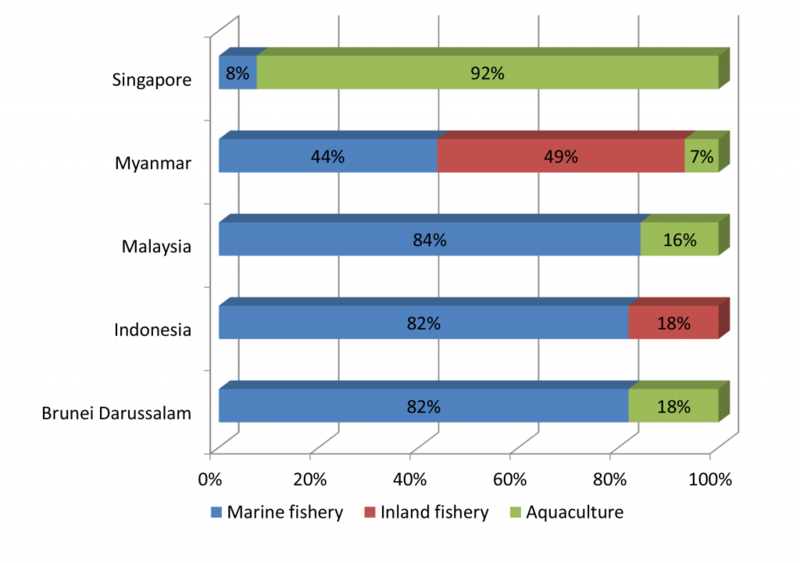 By country, Indonesia which led the Southeast Asian countries accounted for about 37% of the region’s marine capture fishery production value in 2014, with Malaysia emerging second contributing about 22%. Meanwhile, Myanmar which came in third in terms of value contributed about 21%, Philippines came in fourth at 13%, and Thailand contributed about 7% during the same year. Aggregating the 2014 production volume from marine capture fisheries by major commodity groups, marine fishes provided the highest volume (Table 5) accounting for about 87.8% followed by crustaceans at 3.7% while the mollusks and invertebrates contributed 3.3% and 0.7%, respectively. It should be noted that 4.5% was contributed by other commodity groups which could not be appropriately classified as some countries were not able to provide their respective production volume by species, e.g. Viet Nam. In 2014, the production volume of marine fishes and mollusks had slightly increased from that of 2013 by about 4.2% and 2.9%, respectively, but the production volume of crustaceans had decreased by about 4.4% compared with the corresponding volume in 2013. Comparing the volume of the total fishery production in 2014 with that of 2013, an increase in production of the marine fishes is obvious, which could have been influenced by various factors that include: Indonesia’s increased production of various major commodities such as skipjack tuna (Katsuwonus pelamis) from fishing area 711, as well as scad nei (Decapterus spp. ), yellowfin tuna (Thunnus albacores), and frigate tuna (Auxis thazard) also from fishing area 71, and increased production of the stolephorus anchovies from fishing area 572; Thailand’s production of major marine fishes that also increased considerably, especially Rastrelliger spp. from fishing areas 57 and 71; and Myanmar’s increased production of marine fishes nei from fishing area 57. Moreover, production of major species of mollusks had decreased in 2014 compared with that of 2013 which could have been influenced by Thailand’s production of squid that had slightly decreased. Meanwhile, production of crustaceans in 2014 had increased compared with that of 2013, which could have been brought about by Indonesia’s increased production of the giant tiger shrimp from fishing areas 57 and 71, and Thailand’s increased production of penaeid shrimps from fishing area 71. The economically-important marine species that provided sizeable contribution to the 2014 total fishery production of Southeast Asia from marine capture fisheries (by quantity and value) are shown in Table 6. The data indicate that miscellaneous marine fishes (unidentified) contributed the highest volume at 36.72% and value at 28.15%. Production from the tunas group contributed about 11.92% to the total production quantity and ranked the second highest, although it was ranked the highest in terms of value accounting for about 14.24% of the total production value. The data in Table 6 also suggest that the production value of crustaceans group is valued the highest among the commodities harvested through marine capture fisheries at US$ 2697/MT followed by the mollusks group at US$ 2625/MT; Thunnus alalunga (albacore tuna) at US$ 2553/MT; Thunnus obesus (bigeye tuna) at US$ 2464/MT; Thunnus maccoyii (southern bluefin tuna) at 2354/MT; Scomberomorus spp. (seerfishes nei) at US$ 2322/MT; Thunnus albacores (yellowfin tuna) at US$ 2311/MT; Thunnus tonggol (longtail tuna) at US$ 1814/MT; Selar crumenophthalmus (bigeye scad) at US$ 1807/MT; Rastrelliger spp. (other rastrelliger species) at US$ 1740/MT; Megalaspis cordyla (torpedo scad) at US$ 1401/MT; and Stolephorus spp. (stolephorus anchovies) at US$ 1381/MT. The average price of miscellaneous marine fishes (unidentified) which contributed the highest volume in 2014 was estimated at US$ 996/MT, implying that this group must have generated low-value fishes that possibly include trash fishes. Southeast Asia’s production from inland capture fisheries from 2010 to 2014 had generally increased and its growth during the same period had been remarkable. The region’s total production from inland capture fisheries in 2014 was 3,028,233 MT accounting for approximately 15% of the region’s total capture fishery production or 7% of the region’s total fishery production. It should be recognized however that the compilation and reporting of production data from inland capture fisheries had been particularly weak and need to be improved. Thus, the data so far reported could be insufficient in terms of quantity and species composition. It should also be considered that in the real situation, catch of rural community members comprising the main users of the inland resources, is consumed locally and is usually not reported in local or national statistics. Accordingly, data on the total catch from inland capture fisheries in this publication could be considered as indicative only. 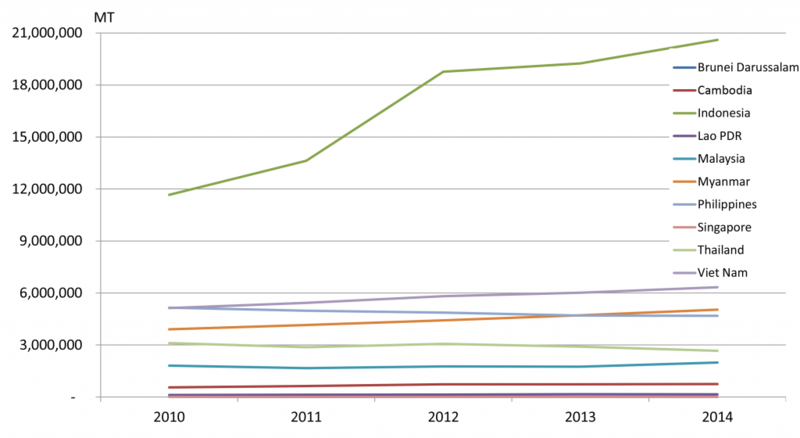 While eight countries reported their respective data on production from inland capture fisheries during 2010-2014, only six countries reported their corresponding production values. Thus, the actual regional production trend of the inland capture fisheries sub-sector could not be established. At any rate, as the consistent top producer, Myanmar maintains a stable inland fishery production from 2010 to 2014 that accounted for 33.8% of the country’s total production from capture fisheries, 27.3% of the country’s total fishery production, and 3.3% of the region’s total fishery production (Table 7). The second highest producer, Cambodia reported production volume of 505,005 MT in 2014 that represented 80.8% of the country’s production from capture fisheries, 67.7% of the country’s total fishery production, and 1.2% of the region’s total fishery production. However, such production volume could not be confirmed as accurate considering that the country needs to improve its systems of collecting and compiling the fishery statistics, especially with regards to the production from inland capture fisheries. Only four countries, namely: Indonesia, Malaysia, Philippines, and Thailand, had provided their respective production data from inland capture fisheries by species, while the other countries were not able to report due to inadequacy of expertise in identifying the catch by species. Capacity building in this aspect is therefore necessary to enable the countries to compile their respective inland fishery production by major groups of species. Thus, production from inland capture fisheries of Myanmar, Lao PDR, Cambodia and Viet Nam in 2014 could not be analyzed in terms of species since species breakdown was not reported. Production of Indonesia, as the region’s third highest producer, was made up mainly of the striped snakehead (Chana striata) which accounted for about 8.7% of the country’s total production from inland capture fisheries. In 2014, the region’s total production from aquaculture accounted for about 53.4% of the region’s total fishery production in terms of volume and 40.7% in terms of value. From 2010 to 2014, Southeast Asia’s total production from aquaculture steadily increased at about 13.0% per year (Fig. 4), the highest annual increase of about 34.0% was recorded between 2011 and 2012, which could have been brought about by the sudden rise in the aquaculture production of Indonesia, Myanmar, and Viet Nam during the same period that also continued to increase until 2014. While the aquaculture production of Lao PDR, Philippines, Singapore, and Thailand had been slightly decreasing from 2013, production from aquaculture of the other Southeast Asian countries continued to increase, except those of the Philippines and Thailand that decreased a little during the same period. 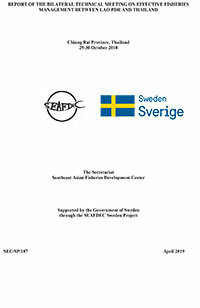 Production of eucheuma seaweeds nei (Eucheuma spp.) of Indonesia, as the largest producer from aquaculture in 2014, contributed 62.9% in terms of production volume and 54.6% in production value to the region’s total production of eucheuma seaweeds, which also accounted for about 63.0% of the country’s aquaculture production. This was followed by gracilaria seaweeds nei (Gracilaria spp.) accounting for 8.0%, Nile tilapia (Oreochromis mossambicus) at 7.0%, torpedo-shaped catfishes (Clarias spp.) at 5.0%, and milkfish (Chanos chanos) at 4.0%. In the case of Viet Nam, as the second highest producer from aquaculture, 67.0% of its aquaculture production came from marine fishes nei (Osteichthyes) followed by penaeid shrimps nei (Penaeus spp.) which accounted for 16.0% of the country’s aquaculture production. For the Philippines as the third highest producer from aquaculture, its main aquaculture product is the elkhorn sea moss (Kappaphycus alvarezii) contributing 61.0% to the country’s production from aquaculture followed by milkfish (Chanos chanos) accounting for 17.0%, Nile tilapia at 7.0%, spiny eucheuma (Eucheuma denticulatum) at 5.0%. For Myanmar, its main production from aquaculture is roho labeo (Labeo rohita) which accounted for 61.0% of the country’s production from aquaculture followed by catla (Catla catla) accounting for 7.0%, tilapias nei (Tilapia spp.) at 5.0%, giant tiger shrimp (Penaeus monodon), mrigal carp (Cirrhinus mrigala) and silver barb (Barbonymus gonionotus) at 4.0% each. Thailand’s main aquaculture product is the whiteleg shrimp (Penaeus vannamei) accounting for 29.0% of the country’s production from aquaculture followed by Nile tilapia (Oreochromis niloticus) at 21.0%, green mussel (Perna viridis) at 13.0%, hybrid catfishes (C. gariepinus x C. macrophalus) at 13.0%. In terms of value per volume of aquaculture production in 2014, Brunei Darussalam attained the highest average value at US$ 11,674/MT followed by Singapore at US$ 8,125/MT, Thailand at US$ 2,846/MT, Malaysia at US$ 2,284/MT, Myanmar at US$ 1,941/MT, Lao PDR at US$ 1,200/MT, Philippines at US$ 913/MT, and Indonesia at US$ 670/MT. 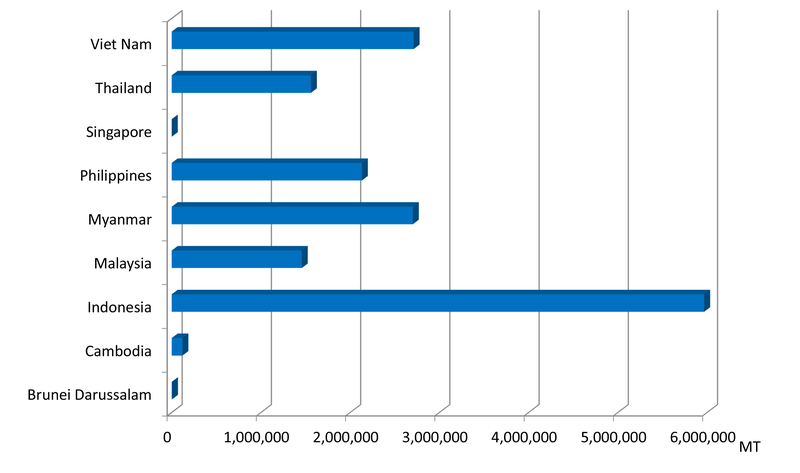 Meanwhile, the value per metric ton of aquaculture production of Cambodia and Viet Nam in 2014 could not be calculated as these countries did not report their respective total production values. Aquaculture production comes from three environments, namely: marine, brackishwater, and freshwater. 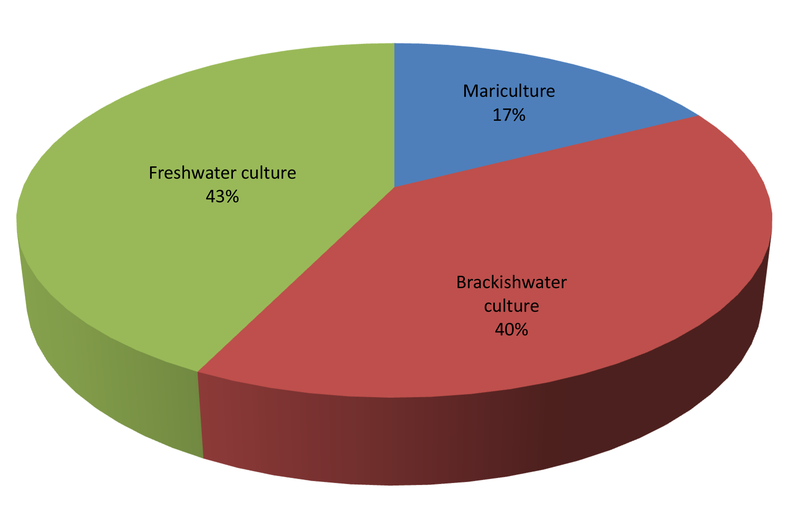 In terms of volume, aquaculture in marine areas or mariculture provided 53.0% to the region’s total aquaculture production in 2014 while culture in brackishwater areas or brackishwater culture contributed 14.0%, and the remaining 33.0% came from freshwater culture (Fig. 5a and 5b). However, in terms of value, freshwater culture production contributed the highest at 43.0% followed by brackishwater production at 40.0% and mariculture production at 17.0%. It should be recalled that in 2013, production from mariculture accounted for 50.0% of the total aquaculture production in terms of volume, while brackishwater culture production accounted for 15.0% and freshwater culture production at 35.0%. In terms of value, mariculture contributed 14.0% to the region’s total aquaculture production value, brackishwater culture production at 45.0%, and freshwater culture production at 41.0%. This means that in 2014, production volume from mariculture increased by 10.3% from that of 2013 which could be due to the increased production of miscellaneous fishes nei in Viet Nam. While production from brackishwater culture in 2014 compared with that of 2013 increased by 72.7%, production from freshwater culture decreased by 2.6%. 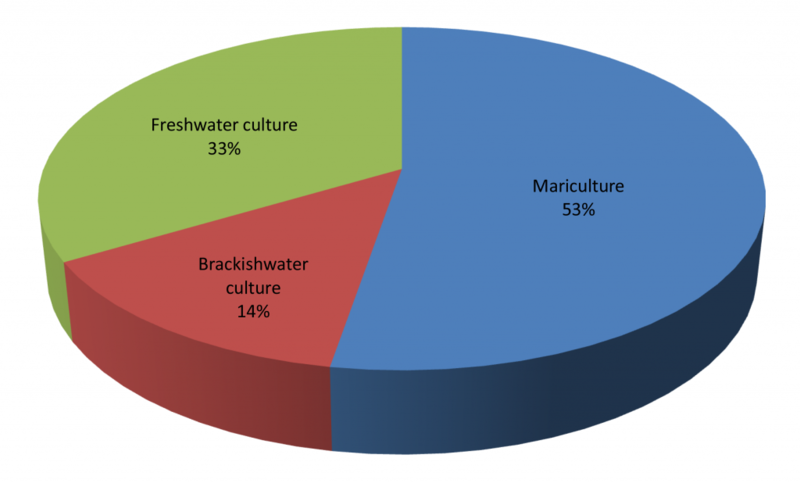 Although the value of production from brackishwater culture in 2014 had decreased but the value of production from mariculture had considerably increased. In 2014, the region’s total production from mariculture contributed about 53.0% to the region’s total production in terms of volume and 17.0% in terms of value. Farmed aquatic plants contributed 91.0% to the region’s total volume of mariculture production, such as the spiny eucheuma (Eucheuma denticulatum), eucheuma seaweeds nei (Eucheuma spp. ), caulerpa seaweeds (Caulerpa spp. ), and the elkhorn sea moss (Kappaphycus alvarezii). Production of eucheuma seaweeds (Eucheuma spp.) mainly from Indonesia accounted for 75.6% of the region’s total production volume from mariculture, followed by the elkhorn sea moss (Kappaphycus alvarezii) the main products of the Philippines which accounted for 14.2%, green mussel (Perna viridis) and blood cockle (Anadara granosa) mainly produced by Thailand at 1.2% and 0.8%, respectively. 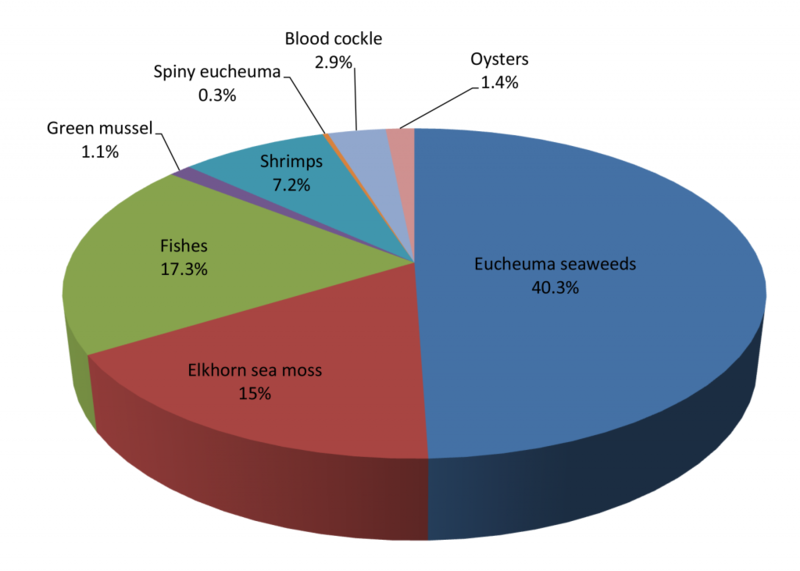 Shrimps, mainly produced by Viet Nam, contributed 1.1%, spiny eucheuma (Eucheuma denticulatum) mainly produced by the Philippines at 0.9%, and oysters group mainly produced by the Philippines and Thailand at 0.3% (Fig. 6a). In terms of value, eucheuma seaweeds (Eucheuma spp.) contributed 40.3% to the region’s total mariculture production value followed by marine fishes accounting for 17.3%. 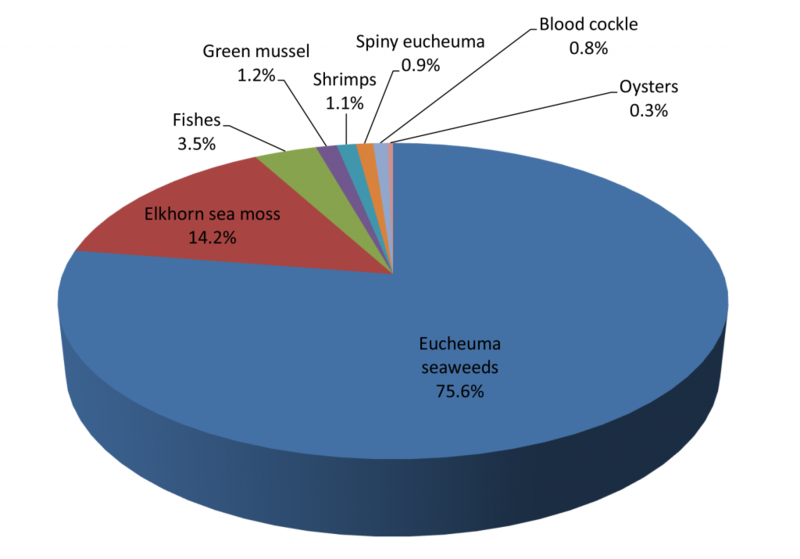 In addition, the elkhorn sea moss contributed 15.0%, shrimps 7.2%, blood cockle 2.9%, oysters 1.4%, and green mussel at 1.1%, to the total value of the region’s mariculture production (Fig. 6b). Moreover, shrimps earned the highest value per volume at US$ 1743/MT followed by marine fishes at US$ 1276/MT, while the lowest value was obtained for the spiny eucheuma at US$ 71/MT (Table 9). For the value per volume of mariculture production in 2014, Brunei Darussalam posted the highest at an average of US$ 10555/MT from its production of the highly economical species of giant sea perch (Lates calcarifer), followed by Singapore at US$ 6755/MT for its production of milkfish (Chanos chanos), and Myanmar at US$ 4364MT for its shrimp production. Meanwhile, the mariculture production value of Thailand was at US$ 893/MT, Malaysia at US$ 815/MT, Philippines at US$ 365/MT, and Indonesia at US$ 185/MT. The total production from brackishwater culture in 2014 represented about 14.0% of the region’s total production from aquaculture (Fig. 7a and 7b). Production of gracilaria seaweeds (Gracilaria spp.) mainly produced by Indonesia had the highest volume representing 35.6% of the region’s total production from brackishwater culture. The second highest was contributed by milkfish (Chanos chanos) at 23.7% contributed by Indonesia and the Philippines, and the third came from whiteleg shrimps (Penaeus vannamei) at 22.5% mainly contributed by Indonesia and Thailand. 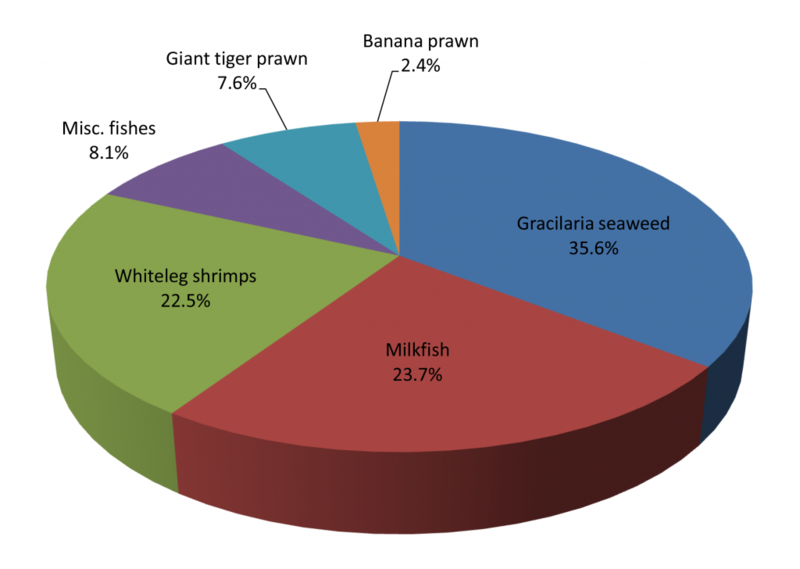 Miscellaneous fishes provided 8.1% and giant tiger shrimp (Penaeus monodon) at 7.6% contributed by Indonesia, Myanmar, and the Philippines. 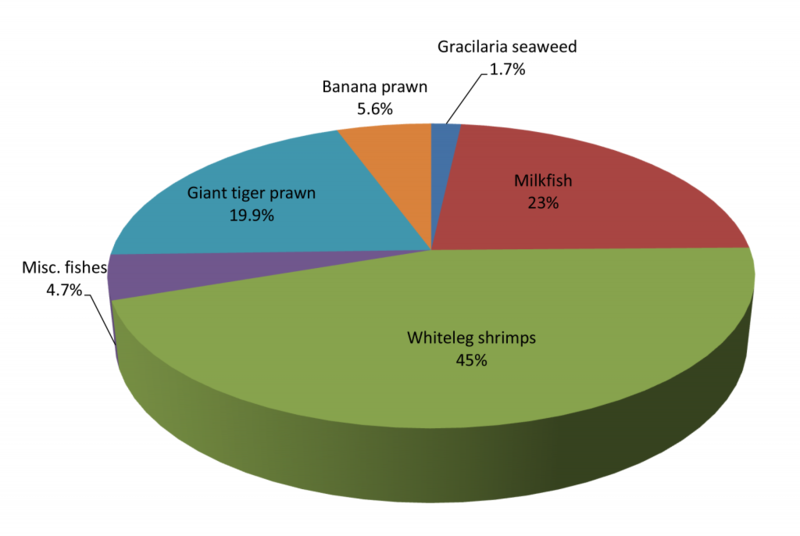 In terms of value, the highest was provided by the whiteleg shrimp (Penaeus vannamei) with Indonesia and Thailand contributing the highest value at 45.0% followed by milkfish (Chanos chanos) produced by Indonesia and the Philippines at 23.0%, and giant tiger shrimp (Penaeus monodon) from Indonesia, Philippines, Myanmar, Thailand, and Malaysia at 19.9%. In terms of average value per volume of production from brackishwater culture, considering only the countries that reported their respective production value, Singapore posted the highest at US$ 26,495/MT, followed by Brunei Darussalam at US$ 12,044/MT, Malaysia at US$ 5861/MT, Thailand at US$ 5,753/MT, Philippines at US$ 4,086/MT, Indonesia at US$ 1,442/MT, and Myanmar at US$ 867/MT. Cambodia and Viet Nam did not report their respective production from brackishwater aquaculture in terms of volume and value. The highest value per metric ton of production was attained by the giant tiger shrimp at US$ 5,806/MT followed by whiteleg shrimps at US$ 4,458/MT, while gracilaria seaweed obtained the lowest at US$ 110/MT (Table 10). The region’s total production from freshwater culture in 2014 accounted for about 33.0% of the region’s total production from aquaculture, an increase of about 5.0% from that of the 2013. In 2014, Viet Nam was the highest producer from freshwater aquaculture contributing about 39.1% of the region’s total production from freshwater culture, followed by Indonesia at 35.9%, Myanmar at 11.8%, Thailand at 5.5%, Philippines at 3.5%, Cambodia at 1.5%, Malaysia at 1.5%, and Lao PDR at 1.2%. Accounting for 43.0% of the region’s total aquaculture production value in 2014, the freshwater culture sub-sector seems to have emerged as a very important fisheries sub-sector. This is considering that its production value in 2014 had increased by almost 0.5% compared with that of 2013, although this information could be underestimated due to the missing corresponding production values from Cambodia and Viet Nam. In terms of production volume from freshwater culture by species (Fig 8a and 8b), miscellaneous freshwater fishes accounted for 34.2% of the region’s total production from freshwater culture, which was mainly contributed by Viet Nam. This was followed by Nile tilapia (Oreochromis spp.) which accounted for 17.2% and contributed mainly by Indonesia, Thailand, and the Philippines, and roho labeo (Labeo rohita) came in next at 7.8% contributed mainly by Myanmar. Torpedo-shaped catfish (Clarias spp.) followed at 9.7% contributed mainly by Indonesia, giant river prawn (Macrobrachium rosenbergii) at 7.5% mainly contributed by Viet Nam, common carp (Cyprinus carpio) accounted for 6.1% contributed by Indonesia, and pangas catfishes nei (Pangasius spp.) at 5.8% mainly contributed by Indonesia. 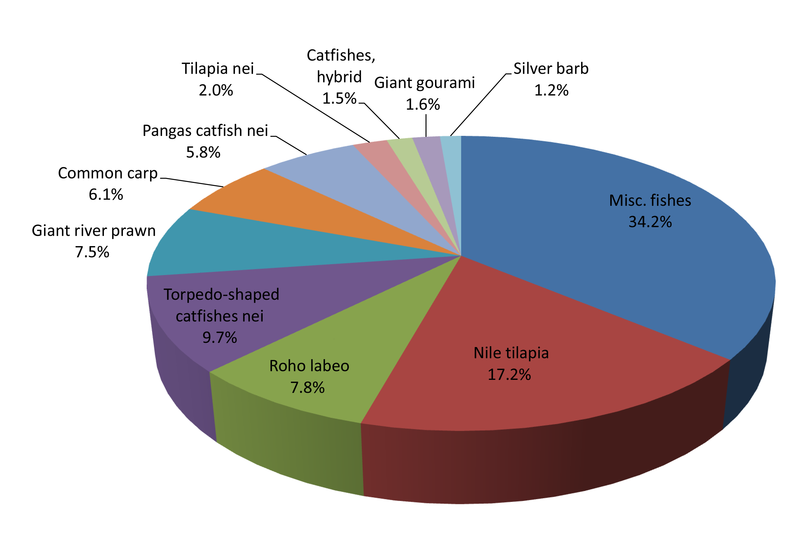 On production value, the highest contributor to the region’s total production value from freshwater culture in 2014 was Nile tilapia at 26.5% followed by roho labeo (14.9%), torpedo-shaped catfishes (14.9%), common carp (11.5%), giant gourami (4.2%), tilapia nei (3.5%), catfishes hybrid (2.3%), giant river prawn (2.0%), and silver barb (1.4%). For the value per volume of major freshwater culture species, the highest was earned by giant gourami at US$ 2582/MT followed by roho labeo at US$ 1899/MT, common carp at US$ 1835/MT, and tilapia nei at US$ 1720 (Table 11). Furthermore, for the value of production from freshwater culture by country, Singapore presented the highest average value at US$ 10,781/MT mainly coming from its production of the Indonesian snakehead (Channa micropeltis). This was followed by Brunei Darussalam at US$ 6,286/MT mainly for its production of Nile tilapia and torpedo-shaped catfishes nei (Clarias spp. ), Malaysia at US$ 2,036/MT also for its production of torpedo-shaped catfishes nei, Thailand at US$ 1839/MT, Myanmar at US$ 1,781/MT, Philippines at US$ 1635/MT, Indonesia at US$ 1,589/MT, and Lao PDR at US$ 1,200/MT. 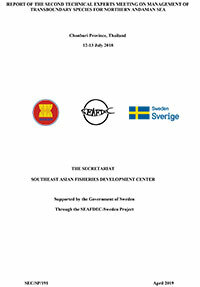 As of 2014, information on fishing gear used in the region reflected in this publication, was based on the production from marine capture fisheries by type of fishing gear as reported by four countries, namely: Brunei Darussalam, Malaysia, Singapore, and Thailand. From such information, the highest production by type of gears in Brunei Darussalam came from trawls accounting for about 62.5% of the total production of all types of gears. This was followed by purse seine at 32.4% with yellowfin tuna (Thunnus albacares), kawakawa (Euthynnus affinis), rainbow sardine (Dussumieria acuta), and bigeye scad (Selar crumenophthalmus) comprising almost all of the commodities produced. For Malaysia, trawls were very prominent with total production that accounted for 47.0% of the country’s production from all types of gears, of which trash fishes comprised 32.3% of the trawl’s total production. This was followed by purse seines contributing about 23.6% to the total production from all types of gears, where scads (Decapterus spp.) comprised 26.2% of the total production from purse seines. Seine nets came third contributing 2.3% to the production from all types of gears, where trash fish accounted for about 45.5% of the total production from seine nets. 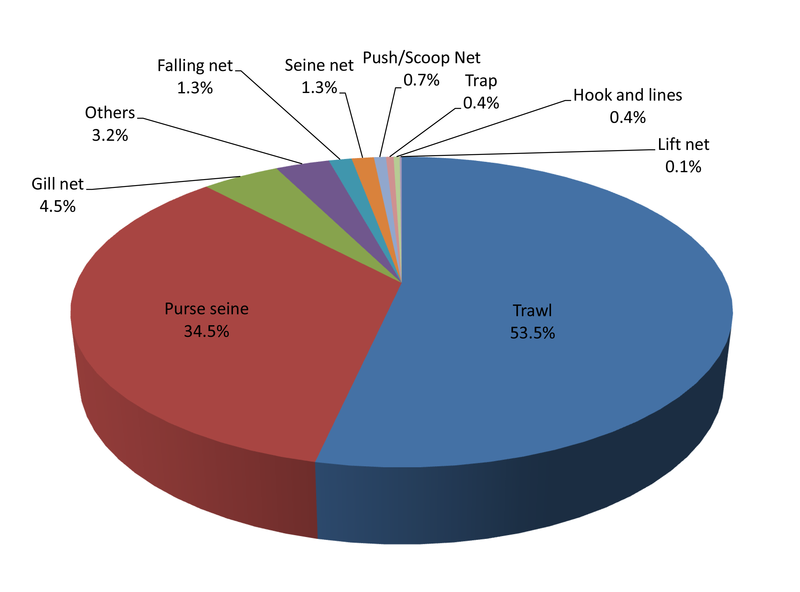 For Thailand, trawls gave the highest production by type of gears for about 44.6% with trash fishes representing about 37.1%, marine fishes nei about 15%, and lizard fishes nei (Saurida spp.) about 5.8%. Purse seines came in second contributing 35.2% to the production from all types of gears with stolephorus anchovies (Stolephorus spp.) at about 20.8%, Indian mackerel (Rastrelliger kanagurta) about 17.7%, and sardinellas nei (Sardinella spp.) about 11.9%. In the case of Singapore, trawls gave the highest production by type of gears for about 100.0% with penaeid shrimps nei (Penaeus spp.) accounting for about 15.7%, marine fishes nei about 15.5%, and blue swimming crab (Portunus pelajicus) about 6.9%. 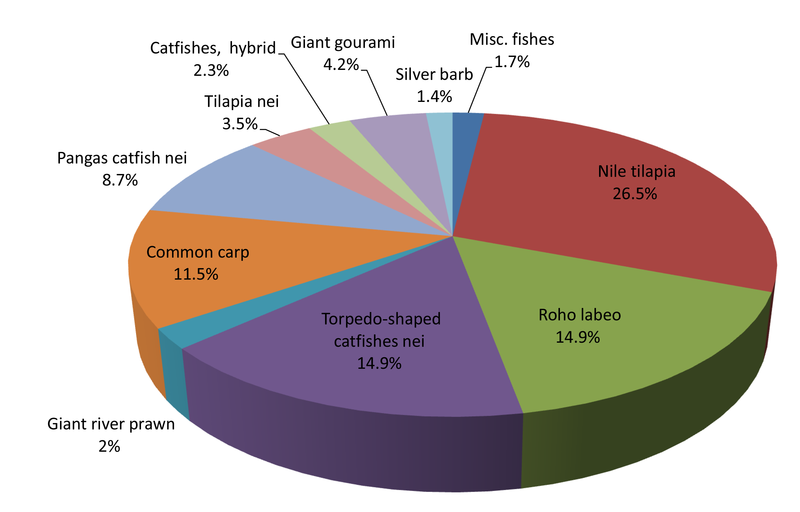 Production from marine capture fisheries of the Southeast Asian region by types of gear is shown in Fig. 9. As the highest producing fishing gear, trawls accounted for about 53.5% of the total production from all types of gears, followed by the purse seines at about 34.5%, gill nets at 4.5%, others at 3.2%, falling nets at 1.3%, seine nets at 1.3%, push/scoop nets at 0.7, traps at 0.4%, hook and line also at 0.4%, and lift net at 0.1%. However, the trend on gear used in marine capture fisheries could not be appropriately analyzed as several countries such as Cambodia, Indonesia, Myanmar, Philippines, and Viet Nam did not provide the relevant information. This report covers only the boats that have been registered in each country of Southeast Asia, except for Cambodia and Lao PDR which did not report their respective number of registered fishing boats in 2014. Based on the data available as of 2014, Indonesia had the highest number of boats at 651,966 of which 174,184 were non-powered while 477,782 were powered boats, followed by Malaysia with 57,972 of which 3,032 were non-powered and 54,940 powered. The third highest number was reported by Viet Nam with 31,235 boats, followed by Myanmar with 28,958 boats of which 13,732 were non-powered and 15,226 powered, Thailand with 23,556 boats, Philippines with 6,317 boats, Singapore with 15 boats and Brunei Darussalam with 38 boats. In 2014, Myanmar had the highest number of fishers at 3,201,750, of which 44% were involved in marine capture fisheries, 49% in inland capture fisheries, and 7% in the aquaculture sector. Indonesia had the second highest number of fishers at 2,667,440 with 82% in marine capture fisheries and 18% in inland capture fisheries. Malaysia has the third highest number of fishers and fish farmers at 169,937 with 84% in marine capture fisheries and 16% in the aquaculture sector (Fig 10). Although minimal, Singapore and Brunei Darussalam also reported their respective numbers of fishers but Cambodia, Lao PDR, Philippines, Thailand, and Viet Nam were not able to provide the information on their respective numbers of fishers. Efforts to improve data availability and statistics in support of data and information should therefore be intensified by encouraging countries to enhance reporting on small-scale fisheries operations through the conduct of census and surveys using questionnaires. This would enable the countries to compile the necessary data and information on fisheries including the number of fishers and fish farmers as well as on the number of fishing vessels and gear used. In 2014, only three countries reported their respective production from aquaculture of ornamental fishes, namely: Indonesia, Malaysia and Myanmar. Of these countries, Indonesia reported the highest production comprising mainly the common carp (Cyprinus carpio) followed Siamese fighting fish (Betta splendens), gold fish (Carassius auratus), and guppy (Poecilia reticulate). Malaysia reported the second highest production in 2014 comprising mainly the cyprinidae, characins, and cichilds. Myanmar reported that its production comprised mainly the gold fish (Carassius auratus) followed barbus (Puntius spp. ), freshwater angelfish (Pterophyllum scalare), and common carp (Cyprinus carpio). In terms of value, the highest was posted by the cyprinidaes and peocillids at US$ 0.36/pc and US$ 0.63/pc, respectively in Malaysia, and goldfish from Myanmar at US$ 0.95/pc. Efforts will be made to improve the compilation of data from aquaculture production of ornamental fishes considering that this is a budding industry in the fisheries sector. The need to collect information on the volume of seeds produced from the aquaculture industry was recommended in many fora as this factor has a significant role to play in enhancing the economic analysis of the region’s aquaculture industry. 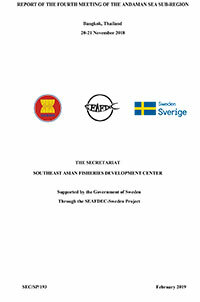 Thus, compilation of the said information was initiated by SEAFDEC in 2008 although only four countries responded, namely: Cambodia, Malaysia, Myanmar and Singapore, by providing the relevant information. Brunei Darussalam joined in 2009 by also giving its data on this aspect. In 2010, Indonesia entered into the picture but information from Brunei Darussalam and Cambodia had faded away. In 2011 however, Brunei Darussalam, Indonesia, Malaysia, Myanmar, and Singapore provided their respective relevant information, and continued to provide the relevant information until 2014. 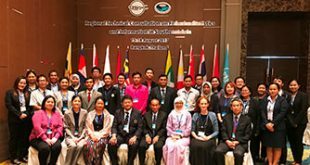 Efforts will be exerted to gather the said information from all the Southeast Asian countries for the next issue of this publication, in order that the true picture of this significant niche of the aquaculture industry could be established. Although the commodities being harvested by the Southeast Asian countries through capture fisheries varied, the trend of the producer prices was established only for certain species which are commonly caught. Results of the analysis however indicated that the producer prices of several commodities harvested by the countries differ in each country, considering that fish prices are influenced by such factors as demand and supply, as well as cost of production including feeds and transportation, and alternative commodities. For inland fish species, the producer price of common carp, Cyprinus carpio in Malaysia in 2014 was recorded at US$ 2.27/kg while it was US$ 1.23/kg in Thailand. For the Hoven’s carp, Leptobarbus hoeveni the producer price in Malaysia was US$ 9.02/kg compared to Indonesia’s US$ 2.26/kg. In the case of the giant river prawn (Macrobrachium rosenbergii), the producer price in Brunei Darussalam was US$ 9.7/kg while the lowest price was US$ 4.92/kg in Indonesia or an average price of US$ 14.62/kg. For other freshwater prawns (Palaemonidae), the producer price in Thailand was US$ 21.55/kg while the lowest price was US$ 2.87/kg in Indonesia or an average price of US$ 12.21/kg. For marine fish species, the producer price of barramundi (giant seaperch), Lates calcarifer in Brunei Darussalam in 2014 was US$ 5.22/kg compared to Indonesia’s US$ 2.09/kg. Grouper nei, Epinephelus spp. in Singapore cost US$ 9.07/kg in 2014 compared to US$ 5.97/kg in Brunei Darussalam. Likewise, for the threadfin breams nei (Nemipterus spp.) the producer price in Singapore was US$ 7.91/kg which was much higher than that of Indonesia at US$ 1.33/kg. Meanwhile, the producer price in 2014 of the false trevally (Lactarius lactatius) in Thailand was US$ 10.77/kg compared to Indonesia’s US$ 0.82/kg. For silver pomfret (Pampus argenteus), the producer price in Thailand was US$ 18.5/kg while it was US$ 3.02/kg in Indonesia. For the Indian mackerel (Rastrelliger kanagurta), the producer price in Brunei Darussalam was US$ 3.94/kg while the lowest price was US$ 1.07/kg in Indonesia or an average price of US$ 2.14/kg. For the giant tiger shrimp, the highest producer price was in Brunei Darussalam at US$ 9.7/kg while the lowest was US$ 5.16/kg in Indonesia or an average of US$ 7.43/kg. For banana shrimp (Penaeus merguiensis), the highest price was in Malaysia at US$ 9.92/kg with the lowest in Indonesia at US$ 3.38/kg and an average of US$ 7.11/kg. For the Indo-Pacific swamp crab (Scylla serrata), the highest price was in Singapore at US$ 12.43/kg with the lowest in Indonesia at US$ 3.21/kg for an average of US$ 5.89/kg. In the case of the blue swimming crab (Portunus pelagicus), the highest price was in Thailand at US$ 7.48/kg and the lowest was in the Indonesia at US$ 2.20/kg, and an average price of US$ 4.55/kg. As for the hard clams nei, Meretix spp. the highest price was US$ 11.85/kg in Thailand while the lowest was in Indonesia at US$ 0.66/kg with an average of US$ 6.25/kg. As could be gleaned from the abovementioned information, the producer price trends among the countries in the region for the same commodities generally had very wide variations.